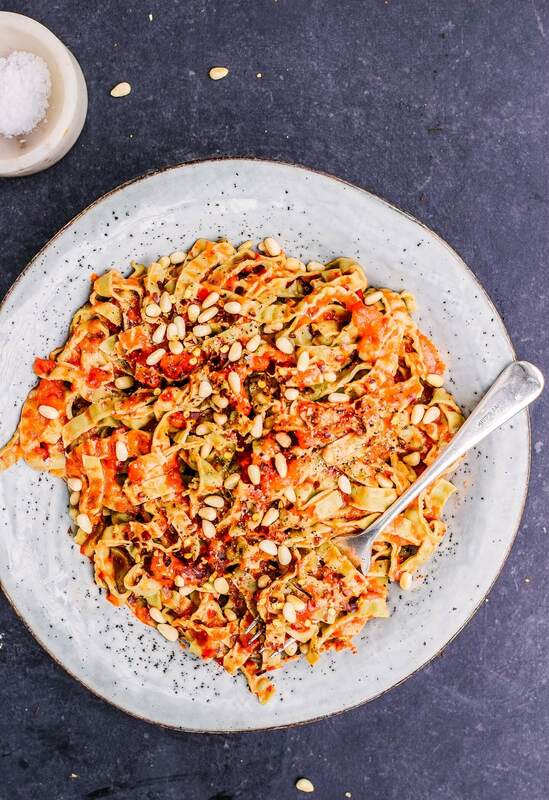 This Red Pepper Pine Nut Pasta is so delicious and simple. I’m quite heavy handed with the chili flakes before serving but if you don’t like heat you can simply leave them out. I love that you can make the sauce up to 2 days ahead of time and have it ready for busy nights, so comforting and easy! Preheat the oven to 200’C. Chop the peppers in half and discard the centre and stalk. Lay them out on a roasting tray, skin side up, and drizzle over a tablespoon of olive oil. Roast at 200’C until charred, about 30 minutes. Add the remaining olive oil to a pan on low-medium heat. Add in the garlic and onion and cook for about 5 minutes until softening. Add in the cherry tomatoes and continue to cook on a low heat, stirring often, until soft and sweet- about 10 minutes. When the peppers are done, cover the roasting tray with tin foil and let them steam for about 10 minutes. Then remove the skins. Add the peppers, onions and tomato mixture, nut milk and a good pinch of sea salt and pepper to your blender and blend until smooth. Get your pasta boiling and cook it according to the packet. While that’s on, toast your pine nuts in a pan. When they’re toasted, pour in the sauce to heat it up. 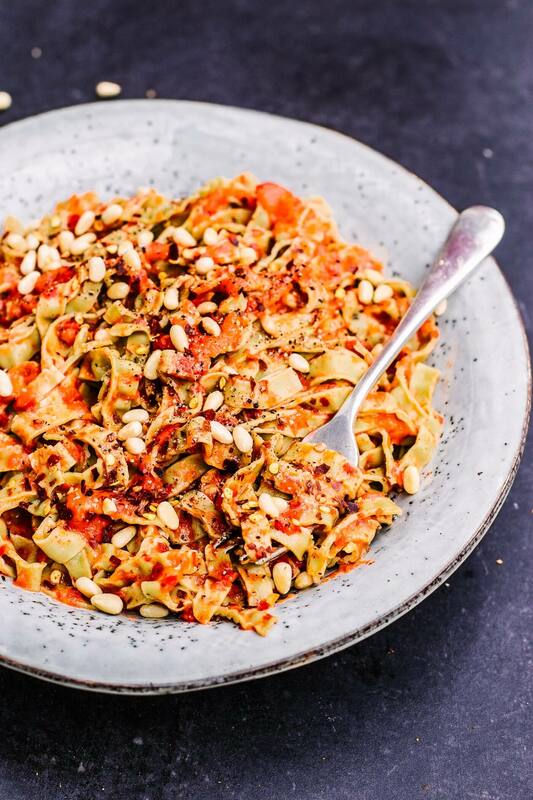 Serve the pasta tossed in the sauce with chili flakes to taste. Just wondering is almond milk ok to use? Hi Indy! Big fan here! Absolutely love your recipes, especially the sweets! On this recipe, when you say to cover the peppers with foil and let them steam, do you mean in the oven or outside?